Lesley Harries-Jones is a Canadian artist currently residing in Toronto, Ontario. She is a graduate of the Toronto School of Art. Her work forms part of private collections in NYC and Canada. Lesley is represented by Stax Gallery in Hamilton, Ontario. 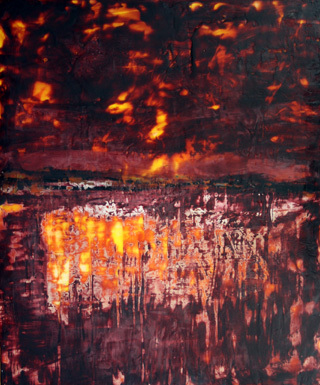 Lesley uses the encaustic medium to document the evolving destruction of the environment and evoke the tenuous relationship between man and nature. Her intent is to draw the viewer into an examination of color contrast and form, illustrating her interpretation of the impact man continues to leave on our physical surroundings. The seductive nature of pigmented wax at first presents texturally appealing abstract form that upon further reflection reveals complex meaning, as the subtle suggestion of landscape emerges. The gouged, scraped, burned application of encaustic resonates with the viewer and results in a dramatic and provocative response. Currently my medium of choice is encaustic painting. I create paintings that reflect my way of seeing nature. The sculptural and transparent qualities of encaustic capture perfectly my impression of landscape. Depicted in my paintings are dramatic landscapes defined and described by light and the effect light has on transforming what we see around us. The abstract images describe the vibrant colours and texture often overlooked as we interact with our environment. What emerges from my compositions are the elements of nature that reveal the remarkable splendour of nature at work. The physical and technical process of painting fascinates me. I love the challenge of taking an idea; an impression, or ordinary image and transforming it into a visual language that describes my interpretation of the subject depicted, evoking for the viewer an emotional response reflective of their personal impression of what the painting means to them.